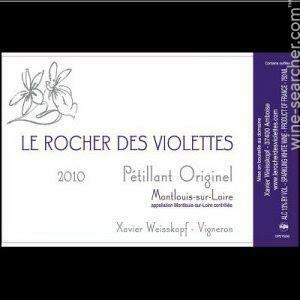 Xavier Weisskopf founded Le Rocher des Violettes in 2005 after studying winemaking in Chablis and Beaune and earning his degree in viticulture and oenology. He quickly went to work for the hard working and demanding Lous Barruol at famed Gigondas producer Chateau de Saint Cosme. He quickly rose to the rank of chef du cave, making 4 vintages during his tenure. His love for Chenin Blanc drew him to Montlouis, where an underappreciation of this historic appellation allowed him to acquire 9 hectares of sacred old vine sites (mostly planted pre WWII!). He immediately converted the farming of all his vines to certified organics, with the aim to allow these precious old vines to speak without obfuscation. This traditional philosophy extends into the cellar where his use of older barrels shows the deft touch of true Chenin zen. His goal is simply to make wines of clarity and focus, in very much a Thibaud Boudignon-esque style of laser precision. The results are inarguable; they are fact, they are truth.